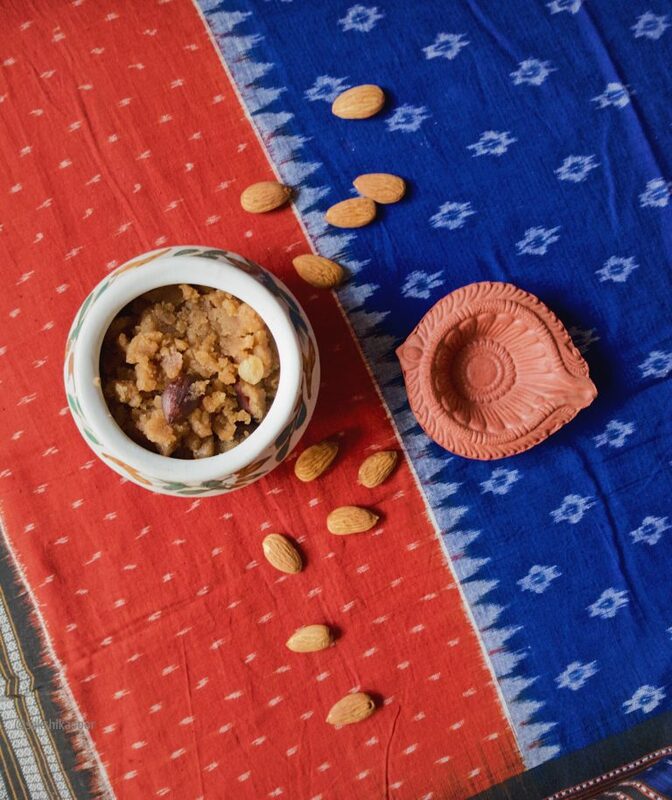 I have always been a fan of Kadha Parshad (roasted sweet offering) given to devotees at Gurudwaras (Sikh Temples). On most visits it would be served hot, right in the palm of my hand and would embalm it with the melted ghee and a toasty aroma. I would quickly scoop a small amount from my palm, throw my head back and slip it in my mouth to soothe my craving. I tried not too look too hungry or desperate but that tiny morsel would go straight to my soul and give it a warm tight hug. Suddenly a voice from behind would say, “bibi sarr dhhak!” (lady, please cover your head!) because the mandatory head scarf would have slipped down to my neck as I relished the offering. I would remember where I was and pull my head scarf to cover my head. That is how much I love Kadha Parshad served at Gurudwaras. 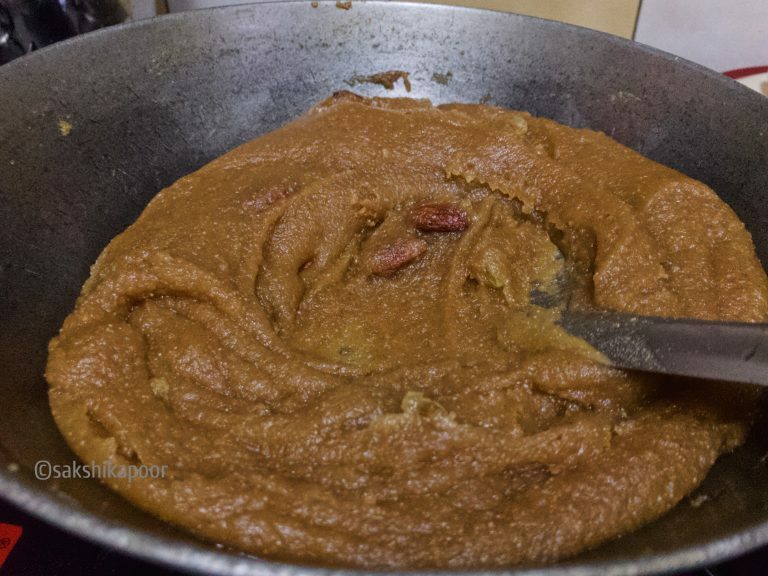 Until now I had not tried to prepare it at home because my mother always said that the whole wheat used to make the halwa at Gurudwaras was ground coarsely by sevaks there and the halwa made at home could never be as divine! But that fact couldn’t stop me from trying to make a Kadha Parshad inspired Aate ka Halwa at home. And because it was at home I could customize it. Of course, it would still not be the simple soul satisfying Kadha Parshad from the temple but it would still make me extremely happy! Perfect for the festive season, here’s my recipe to that happiness. In a heavy bottom kadhai (wok) heat the ghee. 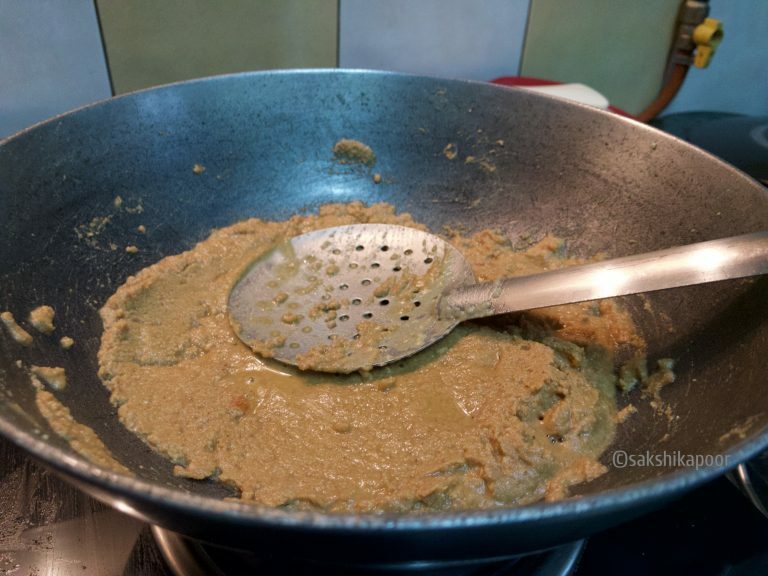 Once melted, add the aata, sooji and besan and mix till the flour is soaked in ghee. 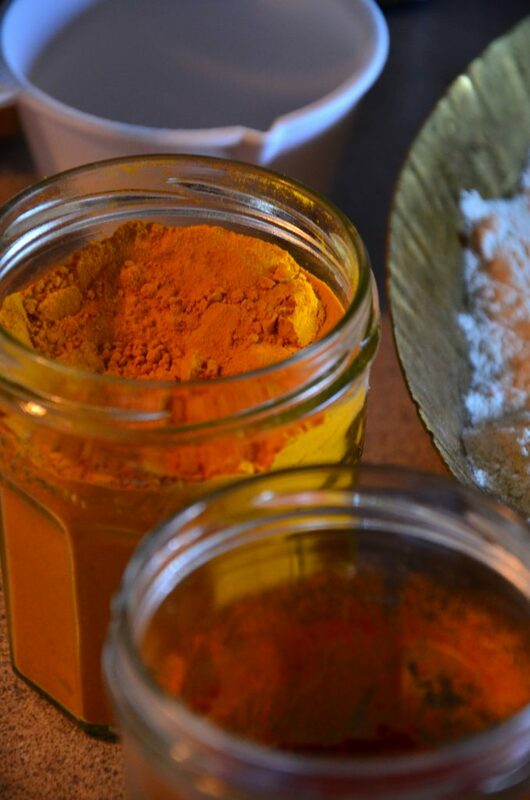 If you want you can add more ghee. The mix should be creamy. Cook this mix on low flame, stirring continuously till it becomes golden. Half way through, add the almonds (whole or sliced). 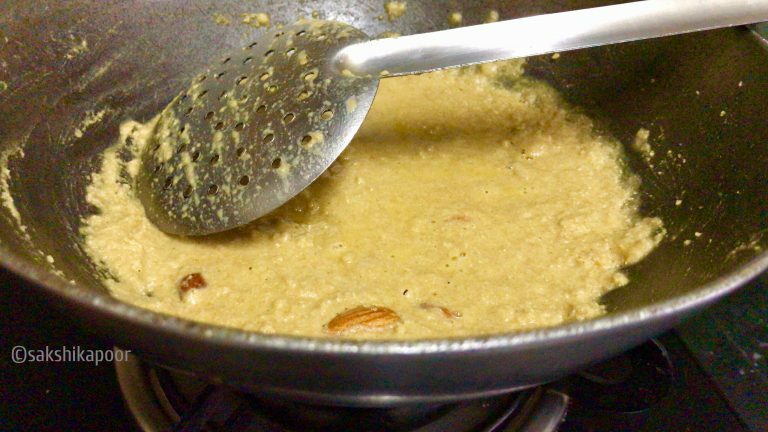 Meanwhile, put the water, sugar, cardamom and raisins together in a pan and cook on a low flame till the sugar dissolves. Let this be on the heat till it is just about boil. 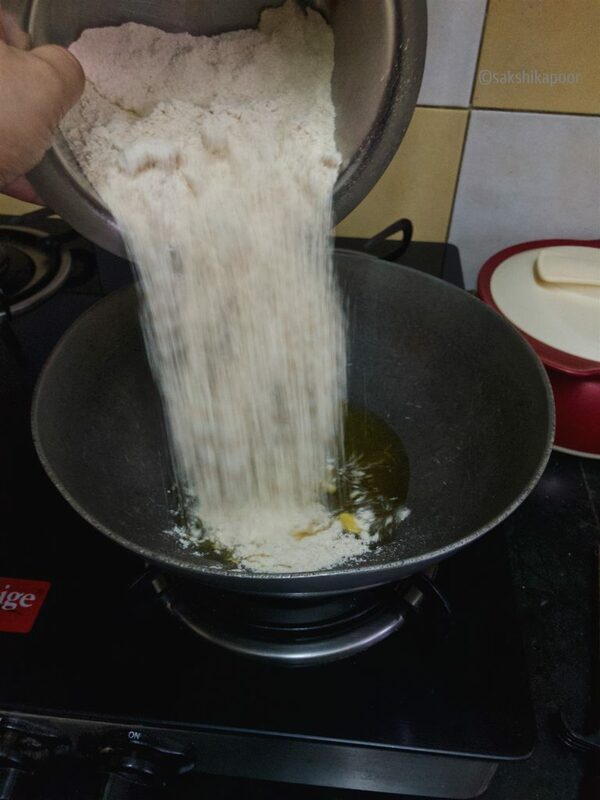 Once the flour is the perfect colour, add the water mix to the wok while stirring continuously. Make sure there are no lumps. You’ll have to do this carefully on a low flame as it will cause a splash. Keep stirring and you will soon find that it looks like a creamy rich mass. 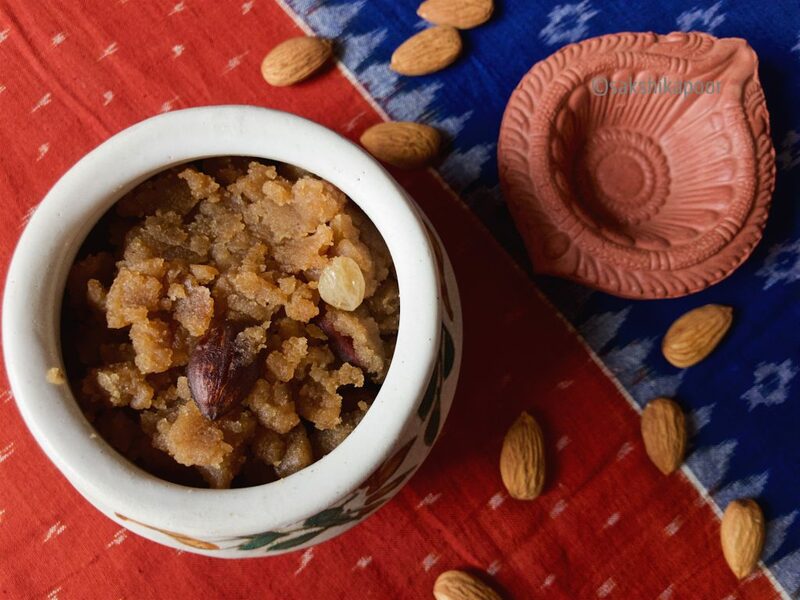 Transfer to bowls and serve this rich Aata halwa hot! Once the flour is the perfect colour, add the water mix to the wok while stirring continuously. Make sure there are no lumps. You'll have to do this carefully on a low flame as it will cause a splash. Beautiful. I so wish I could taste it!! !